As she approached the hall where the wedding celebration was to be held, Mary was attentive to the individual people within the groups swirling around the festivities. She was aware, although not particularly conscious, of a certain deference that was accorded her and her son as they quietly made their way to their places. She often smiled inwardly at the reaction of people to her son. At thirty years old, he was a man of unremarkable style and stature, yet people noticed him immediately. Perhaps it was the way he carried himself, perhaps it was an indefinable expression in his eyes, perhaps it was the quiet sureness in his demeanor as he escorted his mother. But Mary was long accustomed to the way people noticed him, and this was a comfortable gathering of people who she knew well – nearly all fellow townspeople, and many were kinsmen. A wedding was a very special event for Mary. She took to heart the importance of the community coming together to acknowledge the very special relationship that was beginning – the commitment not only to the future of the bridal couple, but to a future generation, and indeed to the future itself. For her, a wedding was a time for the entire community to pledge their respect and support for that commitment to the future. A future that did indeed involve them all. At some weddings, she knew the couples well, others only slightly. Some couples seemed more likely to fulfill their dreams, and some less so. But Mary looked at each wedding as an opportunity to show her support for those ideals by her attendance. And nearly every couple whose wedding she attended would feel, if only for a fleeting moment consciously, her affirmation of them and their commitment. It was clear, in the sincerity of her simple greeting and congratulations, that she offered full support for them and their future. This particular wedding, though, had a certain edge to it. She had the feeling that the complications of the arrangements and preparations had, perhaps, overshadowed the celebration of commitment for the bridal couple. Mary clearly remembered her own wedding, which, although far simpler than her parents would have liked, had been complicated enough. She was grateful to them, that her parents had gracefully accepted her wish for a far simpler affair than they themselves had dreamed of for the wedding of their only daughter. It was difficult, she knew, to balance the enormity of the production with the sanctity of the moment. This celebration, though, had a somewhat discordant note occasionally intruding, and the bride and groom were perhaps a little too glittering and a little too giddy. She had known the bridegroom, Samuel, since his birth to her cousin, Libby, some twenty-three years before. Sarah, the bride, was the oldest daughter of a near neighbor and had often played under the shade tree near Mary’s garden when she had been a toddler and her mother would stop by to visit with Mary. Sarah was a quick and lively girl who had tended to be somewhat raucous and mischievous in her childhood. During her young maidenhood she had developed considerable grace and dignity, but occasional flashes of mischief still erupted from time to time. Her liveliness made her popular with a large circle of girls her own age, and the object of attention by a number of young men. The new couple would set up housekeeping in a house that Samuel had built himself, and was just a short way down the road from Mary’s own house. Both families were happy that the newlyweds would be living close by. As the oldest son, and oldest daughter, respectively, the wedding was a milestone “first” for both families. Although the newlyweds were somewhat stilted in their celebration, the festivities generally proceeded nicely. There were numerous toasts to the couple, a number of prophecies offered, and a number of memories recalled. The gathering was a happy one, with plenty of food, drink, and conversation flowing freely. Old friendships were renewed and new friendships begun. Then Mary happened to notice the headwaiter signaling to Samuel, with some concern in his expression. Mary watched as Samuel made his way over to the headwaiter and they proceeded to discuss something about the supplies with an air of apparent chagrin and some exasperation. Samuel counted down the line of large wine jars, tapping each one, in order, with his foot. Then he raised his hands in exasperation. At that moment Mary intuited the situation. They had run out of wine for the celebration. Her heart sank for them as she realized the implications of this fairly trivial disaster. It would be very embarrassing to the new couple and to their families, if they could not properly host this wedding celebration. The underlying uncertainty of both the bride and the groom in this unfamiliar role, had suddenly taken the fore. Mary saw that the bride, Sarah, had from across the room, also seen and understood what her bridegroom and the headwaiter were discussing. Samuel looked angry and embarrassed. Sarah looked like she was going to cry. 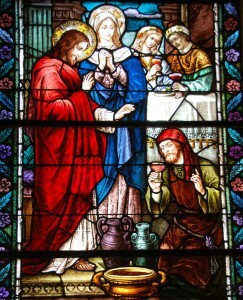 Mary knew that this simple lack of wine would be seized on by some of the townspeople as a story to be kept alive forever to ridicule the new couple. Perhaps idly, but still cruelly, the ridicule would persist. Living in one small town for one’s entire life could give small things some big implications sometimes. And this tiny complication could project a shadow over this marriage that could last a lifetime. And Jesus said to her, “Woman, how does your concern affect me ? My hour has not yet come.” Mary, looked at him for a moment, then turned to the waiters, now clustered around the empty jars, and told them “Do whatever he tells you”. With that, she smiled her thanks to Jesus, and turned and made her way back toward her place at the table. Jesus then turned to the waiters, gestured toward the wine jars, and said, “Fill the jars with water”. Something in his manner caused them to obey him without question. The waiters hefted the large empty jars, one by one, and moved out the door to the well, some thirty yards away. After filling the jars with water from the well, they wrestled each full jar back into position. When they were all returned a few minutes later, Jesus said to them “Draw some out now and take it to the headwaiter.” So they took it. 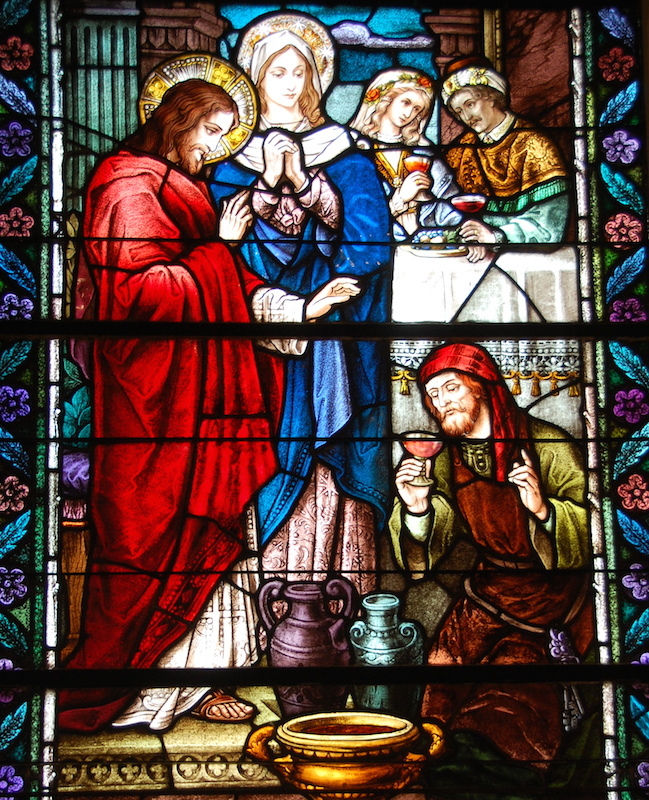 Mary watched from across the room, as the headwaiter tasted the water that had become wine, without knowing where it had come from. From his expression he was clearly pleased, but also startled. He nodded to the waiters to serve this wine. After taking another taste, he walked over to the bridegroom, who had just rejoined his bride, having been delayed in several conversations with well wishers on his way back from the wine jars. According to John’s account, the headwaiter informed the bride and groom that more wine had, indeed, been located. Then he mildly complained to Samuel that this fine wine should have been served first, then the other wine. What Mary observed was that, after a brief conversation between Sarah, Samuel, and the headwaiter, both Sarah and Samuel appeared greatly relieved and then quite happy. As the headwaiter moved off to attend to other duties, Sarah and Samuel looked at each other deeply and happily, momentarily ignoring the rest of the room. They looked as though they felt a happiness beyond any reasonable reaction to averting a very minor disaster. They looked as though they felt blessed.